We’ve been working local this past couple of weeks! Parv’s Barista Lounge is a new coffee shop in the heart of West Bromwich, right on the high street. Fresh onto the market, they sell barista style coffee, sweet & savoury snacks and have a brand new open plan space to sit in and enjoy. 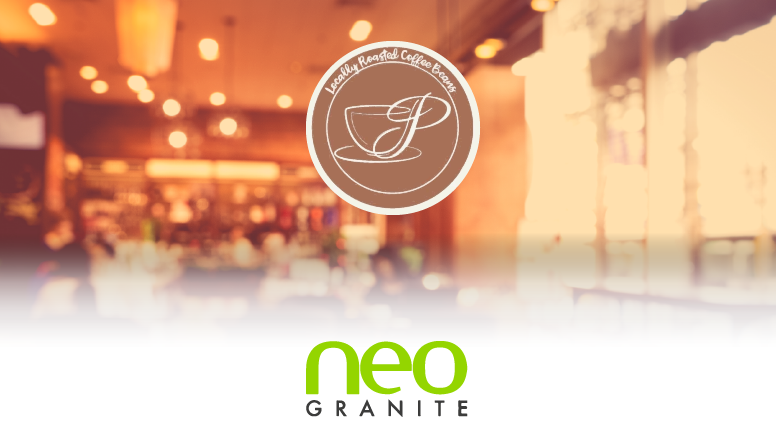 The space itself is relatively new, with refurbishment having taken place before it opened, they called us to help manufacture and install their main counter space and use their logo to create a stone plate as the main feature of it. The counter itself was relatively wide and was retrofitted around the available space which was a small task in itself. The agreed colour scheme was black and white primarily, whereas it was the logo slate that adopted more of the brand colour with the brown/cream colour scheme. During the manufacturing process, we used Silestone Blanco Zeus as the bulk of the counter space, with a Blanco Zeus mitred front. The front itself had a space perfectly cut out to fit in the logo plate, for a flush and tight feel. It was made from stone and the logo itself was engraved and slotted into the front. To compliment the counter, we added brown quartz end panels to help finish off the look, this not only compliments the brand colours, but helps bring everything together in a fantastic way. Just like every job we undertake, we make sure to use our industry leading machinery and years of collective experience to perfect the craft and make sure satisfaction is the highest it can be. We really loved working here, as it was nice to give a start-up business a helping hand on the start of their journey. We specialise in all aspects of stone work and we’d gladly help you through the entire process.